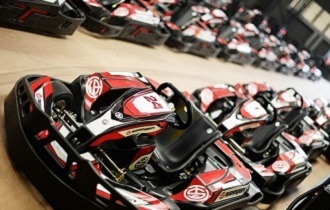 A 500 metre multi-level kart track set in the heart of the Midlands and close to all major travel routes. The circuit is one of the newest in the UK and is a well managed venue with a range of race formats for adults, juniors, stag/hen parties or corporate groups looking for full venue hire. From the A45 Birmingham to Coventry road take the B4101 (Tile Hill Lane) at Lime Tree Park and follow the road westbound until you reach Station Avenue where you should turn left (southbound). Take the left turn into Cromwell Lane then left into Charter Avenue then left into the Charter Avenue Estate on Curriers Close. Follow the road round to the track. An exclusive event for UP TO 8 juniors. Drivers briefing followed by 10 minute practice session, 10 minute qualifying session, 10 minute grid started race or 10 minute timed session depending upon driver ability, Electronically Timed Lap Time Printouts.